For the later Republic of Suriname, see Surinam. An illustration of a Dutch plantation owner and slave from William Blake's illustrations of the work of John Gabriel Stedman, first published in 1792-1794. The colonization of Surinam is marked by slavery. Plantations relied on slave labour, mostly supplied by the Dutch West India Company from its trading posts in West Africa, to produce their crops. Sugar, cotton, and indigo were the main goods exported from the colony to the Netherlands until the early 18th century, when coffee became the single most important export product of Surinam. The Amsterdam stock market crash of 1773 dealt a severe blow to the plantation economy, which was further exacerbated by the British-imposed abolition of slave trade in 1807. Many plantations went bankrupt, and without supply of slaves, many plantations were merged to increase effiency. Slavery was eventually abolished in 1863, although slaves were only released after a ten-year transitory period in 1873. This spurred the immigration of indentured labourers from British India, after a treaty to that effect had been signed between the Netherlands and the United Kingdom in 1870. Apart from immigration from British India, Javanese workers from the Dutch East Indies were also contracted to work on plantations in Surinam. At the same time, a largely unsuccessful attempt to colonize Surinam with impoverished farmers from the Netherlands was started as well. In the 20th century, the natural resources of Surinam, which include rubber, gold and bauxite, were exploited. The gold rush that followed the discovery of gold on the banks of the Lawa River spurred the construction of the Lawa Railway in 1902, although construction was halted after gold production proved disappointing. In 1916, the U.S. aluminium company Alcoa began mining bauxite in on the banks of the Cottica River, near the village of Moengo. In 1938, the company built an aluminium smelter in Paranam. Partly due to the importance of Surinamese aluminium for the allied war effort, United States troops occupied Surinam under an agreement with the Dutch government in exile on 23 November 1941. Under the provisions of the Atlantic Charter of August 1941, the Dutch government in exile promised to end the colonial relations between the Netherlands and its overseas possessions, promising them far-reaching autonomy and self-rule. This was eventually accomplished by the proclamation of the Charter for the Kingdom of the Netherlands on 15 December 1954, which constituted a Kingdom in which the Netherlands, the Netherlands Antilles, and Suriname participated in on a basis of equality. In 1975, Suriname left the Kingdom of the Netherlands to become the independent country of Suriname. From 1683, the colony was governed by the Society of Suriname, a company composed of three equal shareholders, being the city of Amsterdam, the family Van Aerssen van Sommelsdijck, and the Dutch West India Company. Although the organization and administration was of the colony was limited to these three shareholders, all citizens of the Dutch Republic were free to trade with Suriname. Also, the planters were consulted in a Council of Police, which was a unique feature among the colonies of Guiana. In November 1795, the Society was nationalized by the Batavian Republic. From then on until 1954, the Batavian Republic and its legal successors (the Kingdom of Holland and the Kingdom of the Netherlands) governed the territory as a national colony, barring a period of British occupation between 1799 and 1802, and between 1804 and 1816. After the Batavian Republic took over in 1795, the Dutch government issued various government regulations for Suriname (Dutch: Regeringsreglement voor Suriname), establishing the government of the colony. In 1865, a new government regulation replaced the previous regulation of 1832, which theoretically gave Suriname some limited self-rule. The colonial elite was given the right to elect a Colonial Council (Dutch: Koloniale Raad) which would co-govern the colony together with the Governor-General appointed by the Dutch crown. Among others, the Colonial Council was allowed to decide over the colony's budget, which was subject to approval by the Dutch crown, but which did not see any involvement of Dutch parliament. In the wake of the 1922 Dutch constitutional revision, in which all references to the term "colony" were deleted and replaced by the term "overseas territory", the 1865 government regulation was replaced by the Basic Law of Suriname (Dutch: Staatsregeling van Suriname) on 1 April 1937. This Basic Law renamed the Colonial Council to Estates of Suriname (Dutch: Staten van Suriname) and increased the membership from 13 to 15. After the Second World War, during which the Dutch government in exile had pledged to review the relationship between the Netherlands and its colonies, the Basic Law was heavily revised. In March 1948, revisions to the Basic Law were adopted by Dutch parliament, which introduced universal suffrage for both men and women, which increased the membership of the Estates from 15 to 21, and which introduced a College of General Government (Dutch: College van Algemeen Bestuur) which was to assist the Governor in the everyday government of the colony, and which was the precursor to the Cabinet of Ministers. The new constitution took effect in July 1948. Although the colony has always been officially known as Surinam or Suriname, in both Dutch and English, the colony was often unofficially and semi-officially referred to as Dutch Guiana (Dutch: Nederlands Guiana) in the 19th and 20th century, in an analogy to British Guiana and French Guiana. Using this term for Suriname is problematic, however, as historically Suriname was only one of many Dutch colonies in the Guianas, others being Berbice, Essequibo, Demerara, and Pomeroon, which after being taken over by the United Kingdom in 1814, were united into British Guiana in 1831. Before 1814, the term Dutch Guiana did not describe a distinct political entity, but rather all colonies under Dutch sovereignty taken together. While referring to post-1814 governors of Suriname as governors of Dutch Guiana seems harmless, it is problematic doing the same for the pre-1814 governors, as that would imply that they had jurisdiction over the other Dutch colonies in the Guianas, which they had not. ^ Oostindie 2005, pp. 7-8. ^ Buddingh' 1999, p. 57. ^ Bakker 1993, p. 76. ^ Bakker 1993, p. 105. ^ Meiden, G.W. (2008) Betwist Bestuur. De eerste eeuw bestuurlijke ruzies in Suriname 1651-1753, p. 11. ^ Buddingh, H. (1995) Geschiedenis van Suriname, p. 26. ^ a b A.F. Paula (1989). "Koloniale Raad". Hoofdmomenten uit de Staatkundige Ontwikkeling van de Nederlandse Antillen. Retrieved 30 May 2012. ^ "Wat gebeurde er op 28 januari 1948?". Suriname.nu. 1989. Retrieved 30 May 2012. ^ See for example this royal decree separating Suriname from Curaçao and Dependencies (1845). 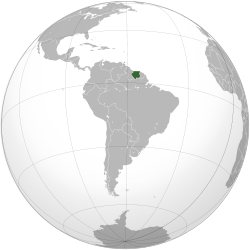 ^ In treaties between the Netherlands and the United Kingdom, the colony is consistently referred to as the Colony of Surinam, e.g. Convention between Great Britain and the Netherlands, relative to the Emigration of Labourers from India to the Dutch Colony of Surinam, the Accession of the Dutch colonies of Curaçao and Surinam to the International Union for the Protection of Industrial Property. ^ This is, e.g., how Jan Jacob Hartsinck uses the term in his Beschryving van Guiana, of de wilde kust in Zuid-America (Hartsinck 1770, pp. 257). Bakker, Eveline (1993). Geschiedenis van Suriname: van stam tot staat. Zutphen: Walburg Pers. Buddingh', Hans (1999). Geschiedenis van Suriname. Zutphen: Het Spectrum. ISBN 9789046811726. Oostindie, Gert (2005). Paradise overseas: the Dutch Caribbean: colonialism and its transatlantic legacies. Oxford: Macmillan Caribbean. ISBN 1405057130. This page was last modified on 4 September 2015, at 22:57.